If the Audio Front Control Module (ACM) is inoperable the ACM part number may be obtained from a label affixed to the chassis. Operate the audio system in radio tuner (AM/FM) mode. Press and hold preset buttons 3 and 6 for 3 seconds until the speaker walk test begins. The display indicates each speaker as it is tested. If the speaker walk test is the only test required, this procedure can be stopped after Step 3 by turning the ACM off. 1 ACM Self-Test SELF TEST The ACM carries out a self-test. At the end of the self-test, the display either indicates SELF PASS or scrolls through any DTCs present. Note that the self-test may not indicate all DTCs that are present. If additional DTCs are suspected, retrieve continuous and on-demand DTCs using the scan tool. 2 View DTCs NO DTCS, or scrolls through DTCs The ACM or FDIM displays any DTCs that are present. To scroll through the DTCs, press the TUNE UP button. If no DTCs are present, the display reads NO DTCS. 3 AM/FM Antenna Signal Strength SIGNAL ### The ACM or FDIM displays the AM/FM antenna signal strength. To run this test, the audio system should be in AM radio tuner mode before entering the ACM self-diagnostic mode. 4 Software Levels SOFT LEVELS The ACM or FDIM displays software levels for various components of the audio system. Knowing the software levels may not aid diagnostics. Press the TUNE UP button to scroll through the software levels. 5 Display Test DISPLAY TEST, then all segments illuminate All of the ACM or FDIM display segments illuminate. 6 Retrieve ACM Part Number RADIO CONFIG The ACM or FDIM displays the ACM part number and various configuration levels. Press the TUNE UP button to scroll to the desired function. To exit the self-diagnostic mode, turn the ACM off. If the SDARS is inoperable the Electronic Serial Number (ESN) may be obtained from a label affixed to the chassis. Operate the audio system in satellite radio mode. Depending on vehicle configuration, press and hold the AUX button and preset button 1 or the SIRIUS button and preset button 1, simultaneously. The Satellite Digital Audio Receiver System (SDARS) module Electronic Serial Number (ESN) displays on the screen. Record the SDARS module ESN . Turn the Audio Front Control Module (ACM) on. If the speaker walk test is the only test required, this procedure can be stopped after this step, or by allowing the speaker walk test to complete on its own. Before the speaker walk test is complete, press the "End Test" selection. On Demand Self Test The ACM carries out a self-test. At the end of the self-test, the display either indicates "Test Passed" or lists any DTCs present. Note that the self-test may not indicate all DTCs that are present. If DTCs are suspected, retrieve continuous and on-demand DTCs using the scan tool. View DTCs The ACM or FDIM displays any DTCs that are present. If there is more than a full screen of DTCs present, to scroll through the DTCs, press the down arrow on the display. If no DTCs are present, the display reads NO DTCS. Press the "Clear DTCs" selection to clear any DTCs present. Configuration Status The display shows the ACM configuration. A "0" indicates the item is configured off, while a "1" indicates the item is configured on. If the ACM appears to be misconfigured, refer to Section 418-01. GPS Info The current Global Positioning System (GPS) satellite information is shown, along with the current vehicle position. Pressing the "SV Status" selection provides additional information, if present. Speaker Walk Test The ACM carries out the speaker walk test. DVD Mechanism Test The ACM tests the internal CD/DVD drive mechanism. Display Test This test provides for testing of the touchscreen colors and the touchscreen sectors. Pressing any of the colors on the display causes the whole display to change to that color; pressing the display again returns to the Display Test menu. Pressing the "Touchscreen Activation Test" selection enters the touchscreen sector test. Press any area of the screen to test the touchscreen sector; press the "X" at the RH lower corner of the display to return to the Display Test menu. Hardkey Test This test provides for testing of the ACM buttons (not the touchscreen). When each button is pressed, the screen displays the button that is active. This test can also be used to isolate a stuck button. Radio Signal Strength The ACM or FDIM displays the AM/FM antenna signal strength. To run this test, the audio system should be in AM radio tuner mode before entering the ACM self-diagnostic mode. HDD Test The ACM tests its internal hard drive. Microphone Test The ACM tests the microphone by supplying a test tone and monitoring the input from the microphone. If there is a concern with the microphone input, the ACM sets DTC B1D79:01. For diagnostics, refer to Diagnosis and Testing in this section. SDARS Signal Strength The ACM or FDIM displays the satellite radio antenna signal strength. 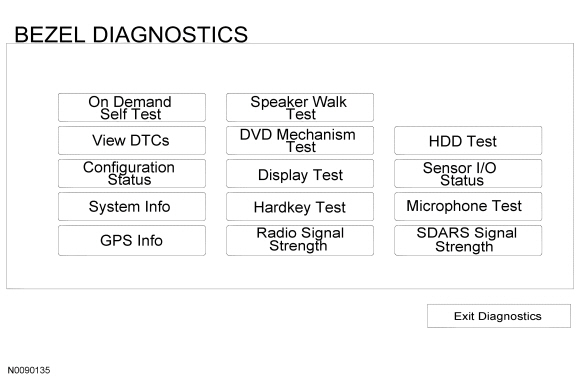 To exit the self-diagnostic mode, press the "Exit Diagnostics" selection from the "BEZEL DIAGNOSTICS" menu.